Comics, The Universe and Everything – Musings on comics, mathematics, elections and anything else I can think of. Well, the UFP Flag didn’t end up being flown for very long. We’re now flying the Earth Day flag that was designed by John McConnell, founder of Earth Day in 1969. This version of the flag features the famous photograph of the Earth that was taken from the Apollo 17 spacecraft. The original version was screen printed; but both were official Earth Day promotional items used to advertise the occasion. The flag I’d originally wanted to fly for Earth Day is the “Flag of the Earth,” (shown below) that was designed by James W. Cadel. It shows a stylized collection of the Earth, Moon and the sun. It flies at Observatories and SETI installations world wide. We’re flying a new flag this morning; specifically the flag of the United Federation of Planets. It flew for a day a few weeks ago, but it was wet and windy and the flag kept getting tangled around the pole so I decided to take it down for a bit. In the meantime, we purchased a Valley Forge Tangle-Free Aluminum Pole (not pictured above) from the Horseheads Do It Center. It’s working beautifully so far. The flag is affixed directly to the pole through the grommets and the entire top section of the pole rotates freely. The weight of the flag itself keeps it from wrapping around the pole. I like this flag, however, it puts me in mind of a lot of state flags, most of which are pretty dreadful. I therefore thought I’d look at the UFP flag in terms of the North American Vexillogical Association’s criteria for evaluating/creating flags. The design of the flag should be simple enough that a child could draw it from memory. It should use clear and understandable symbolism. The flag should use common colors; probably no more than four different ones. Both text and seals should be avoided. Finally, the flag should be unique as it represents a distinct entity. It can however, show similarities to other flags, to show cultural, historical or political connections. A nice example of the last criterion is the similarities between the flags of Ohio and the United States. The flags are distinct but the common elements make it clear that the US and Ohio are closely related. We could segue to a long discussion of state and province flags, but we’ll save that for another day. The existing state flag that was closest to the bottom of the 2001 NAVA survey was Nebraska. The dubious distinction for last place was given to Georgia, but that flag was changed in 2003. Meanwhile, my favorite state flag has to be Alaska; simple and elegant with clear symbolism. It’s a classic. To think about the symbolism, it makes sense to look back to the obvious inspiration for the UFP flag, the Flag of the United Nations. The blue color was chosen in contrast to “red, the war color.” The world map represents all the people of the world. The map projection is surrounded by olive branches, a common metaphor for peace. The similarities to the UFP flag are striking and the symbolism transfers in a straightforward manner. The branches are similar, though may not be of terrestrial origin. The galactic map with the density of the stars in an off-center diagonal line is evocative of a section of one of the spiral arms of the galaxy. Earth and presumably most of the other member worlds of the Federation are located in the Orion Spur, a minor arm of the Milky Way, which exists between the Perseus and Sagittarius Arms of the galaxy. In universe and otherwise, the similarities between the UFP flag and the UN flag make sense since one organization is clearly an inspiration for the other. 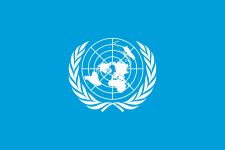 If the UN still existed in the 23rd Century, the two flags might be too similar to be flown together, but I suspect the UN flag has been supplanted by a “United Earth” flag. One place where the symbolism of the UFP flag seems lacking is that there are three stars in the galactic map that are stylized as four-pointed stars rather than circles. These stand out and in a standard flag, these might represent the founding worlds of the Federation. Unfortunately, there are four; Earth, Vulcan, Andor and Tellar Prime. This is not surprising. The UFP flag was designed long before the founding worlds were codified in “These are the Voyages…” the series finale of Star Trek: Enterprise. I might be inclined to add a fourth four-pointed star. It’s about a month on, but I thought I’d share one of my Christmas gifts with everyone. I got a copy of Action Comics #425 from my lovely wife, Joanne. It’s a beautiful copy for a 46 year old book with an iconic Nick Cardy cover. This book is a quasi-key for me for although it doesn’t have a historic story element or first appearance, it has an important place in my history as a collector. Prior to this I’d had limited exposure to comics. I had some vague memories of the Fantastic Four, Spider-Man and “The Marvel Super Heroes” cartoons, although I was convinced that that last was called “The Merry Marvel Marching Society” because of the closing theme (I have no recollection, what-so-ever of the opening theme btw). I think I recall my Dad reading a Daredevil comic or two to me but, 50+ years later I’m not even sure that’s an actual memory and not some sort of mental ret-con. Over the previous few months, I’d gotten a few comics and enjoyed them and as seriously as a 9-year old could, I decided to become a “comic book collector,” whatever I thought that was. I promptly marched out (as promptly as I could, anyway, given that I needed to amass 20¢) and picked up this issue. This was my first comic as a collector. I hadn’t reread this book for most of the intervening time, in fact all I really recalled of it was that there was a “story about an emu.” That’s still better than it could be, I suppose. I can’t remember anything about my first Batman comic, although I know there must have been one since at some point in my life, I didn’t own any Batman comics, and now I own a few. I’d made a few attempts to figure out what this “first official comic” was in the 80’s to no avail. I knew it was an Action, I thought it had an emu in it and I knew it came out sometime in 1973. That’s surprisingly little to go on when your main resource is whatever happens to be in stock at your LCS. Still, 45 years after I’d first picked up the issue, with some skills of google-fu and a visit to what a friend calls “that dark web site,” I managed to track it down. It’s easy to see why I’d have picked this book. The cover is amazing. It’s unusual in that the main hero isn’t the focus; the cover centers on some older kids reading a comic while a little red-haired kid is excited to see Superman flying by in the background. I’m sure it spoke to me. I can’t imagine a better cover to attract a kid who just decided to become a collector. The interior of the book is less impressive. There are three (Count ’em! 3!) stories, which is a surprising number for a standard sized comic. Spoilers follow, but come on… you’ve had 46 years people! The Superman story begins in New Zealand when a hunter, Jon Halaway is attacked by a 12-foot tall flightless bird. He kills it in self defense. It turns out, the bird was a Moa (Sorry, Emu fans). There were nine species of Moa in New Zealand, but all of them had been hunted to extinction by the year 1500. Halaway is distraught, and becomes obsessed by this tragedy. He searches and discovers the Moa had left an egg near an underground hot-spring that emitted “strange fumes.” He wastes no time bringing the egg back to the States, where it becomes clear that it is sapping his life force. The egg hatches and the Moa develops some bizarre powers, including the ability to fly by flapping its feet. After getting telepathic messages from the Moa, Superman is able to return it to the hot spring and Halaway recovers. It’s a pleasant, lightweight story, and I liked the conservational aspect. The second story features the Atom though the title, “The 13 Men Who Run the World” is a bit of a bait and switch. A lot happens and is hung on a thin plot in a mere 6 1/2 pages. We discover Ray’s size-control mechanism is malfunctioning and that Jean is representing a biochemist who is accused of stealing gold from Fort Knox. Her client is being falsely linked to the aforementioned 13 men in the title. In quick succession, a witness who wants to come forward is murdered, Ray and Jean are kidnapped, we learn that the 13 men don’t actually exist, Ray beats the actual bad guys as the Atom and they are brought to justice. The final feature is the first installment of an early Human Target story and it stays close to the character’s formula: someone is in danger of being murdered and Christopher Chance assumes his identity to catch the killer. In this case the potential victim is “the Great Antonio” who is scheduled to walk a tight-rope across Niagara Falls. The ads are fun too. Did you know that a BB gun is an ideal way to convince your parents that you’re responsible enough for an actual, real gun? The ad doesn’t quite come out and say that, but I think the subtext is clear. Evidently owning a B-B gun leads to responsible gun play in later life. Also, you can get enough training from an outfit that advertises in comic books to get a good job in “electronics.” Mr. Bemis, by the way, is the name of Burgess Meredith’s character in the Twilight Zone episode “Time Enough at Last.” Things do not end well for him. There’s also 3 pages of ads for “Pirates of the Caribbean” model kits, which probably seemed excessive for the time and still seems excessive after 5 movies. Also, also there are Sea Monkey’s but not Polaris Nuclear Subs or x-ray glasses. This book was a pleasant trip down memory lane. It makes an interesting addition to my collection; it’s wildly different from the other books I have from the same time period. It’s a sad commentary on the new season of Doctor Who that we actually forgot about the New Year’s Special until today. We still purchased it from iTunes, but our usual pattern is to look forward to the Christmas Special, pay for it in advance and watch it as soon as humanly possible. Here are my thoughts on the special. “Resolution” is perhaps the single least creative title for a New Year’s episode possible. The science fictional elements (in the context of season 11) started off surprisingly well. To avoid spoilers: the special took a classic Doctor Who adversary and added in elements from one of the greatest science fiction novels of all time. It goes downhill from there and some of the elements of the final confrontation are downright cheesy. Like the rest of season 11 the character moments lacked all subtlety and were frequently over written and difficulty to watch. Jodie Whitaker may have finally settled on a personality for her Doctor, although if she has, it’s a pretty generic one. At least she was finally recognizable as the Doctor, which evidently, is no small feat. None the less there were some false moments. The Doctor should be a source of strength for her companions and that precludes telling people that she is “panicked.” Every other Doctor was able to convey the gravity of a situation without undermining morale. The 13th Doctor should be able to as well, but this incarnation seems weaker. Further, this Doctor still seems less competent than previous incarnations. These differences take on greater significance in the context of the First Female Doctor, who needs to be as confident and as competent as her predecessors. Anything else undermines the entire premise of the gender-swap and is simply bad writing. Overall, I’d give the New Year’s Special a “C.” Somewhat better than any individual episode of the last season, but not great. Most of the issues with season 11 were in the writing and I can think of three simple things that could be improved for season twelve. 1) There’s no reason to think that Chibnall isn’t a competent show runner. He should concentrate on that role and appoint a new head writer, preferably someone with a number of good strong Doctor Who episodes under his or her belt. 2) Bring back some seasoned Doctor Who writers. Clearly the experiment of having a staff of all green writers working under Chibnall led to a weak season. And 3) drop the policy of creating all new adversaries for next season. There’s a reason the classic villain are the classic villains; they’re known and they work. The audience is familiar with them and so, more time and energy can be devoted to other elements of the plot. That’s part of the reason that the New Year’s Special was a bit stronger than the episodes within the season proper; it used an established adversary. It’s possible that if the show could maintain this level of quality, it could limp along well enough that there could be a season 13 to follow 12 after which Whittaker and Chibnall plan to make their departures. I just learned that comet 46p/Wirtanen will make its closest approach to Earth this evening. It should be pretty easy to spot; close to the Pleiades, a tiny bit to the south and a bit lower in the sky. It’s supposed to be magnitude 4 which is kind of bright. It’ll be diffuse, but even if it’s hard to pick out with the naked eye, it should be visible in a half way decent pair of binoculars. Here’s an interesting bit of trivia about 46p/Wirtanen. Most comets have orbits that extend into the Oort Cloud, far past the orbit of Neptune. This comet’s orbit only extends about out to Jupiter. It will return to our cosmic neighborhood in about five and a half years as opposed to the decades it usually takes with other comets. With luck, viewing will be better in other areas. I just stepped outside and here the sky is uniformly covered with clouds. I’ll look again later. In the same section of the night sky, the Geminid Meteor Shower could still be visible. The shower peaked Friday morning. I’ve only had good luck viewing a meteor shower once, but when you’re lucky, you can see things that are pretty spectacular as evidenced by this dash cam video. The main image is a screen cap from StarWalk 2 which I annotated with my Apple Pencil. “Who created the Wasp?” might be less of a settled question than is usually believed. I’ve been working my way through the Ant-Man/Giant Man era in Tales to Astonish (TtA) and I made it up to the first appearance of the Wasp a month ago or so. I was enjoying the story and the art and looking at the picture to the left, it’s obvious that Don Heck is the penciller. The art looked particularly good, and I wondered who did the inking. Could Heck be inking himself? I turned to the credits and to my surprise, I discovered Jack Kirby is credited as the artist while heck is only credited as the inker. That seemed to contradict everything I see in the book. What do we get from this? Lee was busy, busy enough to pass off the scripting duties for this issue to Ernie Hart. Tales to Astonish #44 was published for June 1963. To quantify how busy Lee was at that time, we can check his credits at ComicBookDB.com. He worked on at least 11 comics in May of 1963 as well as 8 comics in June and 11 in July. Kirby was no less busy; he worked on 10 comics in May, 7 in June and 10 in July. There’s not a lot here that seems reminiscent of Kirby. You can compare these to any of Heck’s pencils from this time period, this looks like his work. The faces and figures look like Heck’s; one of the characters on page 12 could be a doppelganger of Happy Hogan. The hands look like Heck’s work; he tended to draw longer, more slender fingers on the male characters. The shading also looks like his work; here that tends much more toward hatching (clusters of close parallel lines) than is typical of Kirby’s work. and these from Journey into Mystery #93. The art in these issues scream Kirby. The faces look like Kirby’s and the figures look like Kirby’s. The shading looks like Kirby; Kirby tended toward more and larger areas of solid black than Heck did. The hands look like Kirby’s as he tended to draw blockier, squared-off fingers on the men. So, giving Kirby full credit for the artwork seems dubious. The credits in the issue certainly make it seem there is some element of truth to it, but the other evidence should at least make us think there’s something worth investigating here. Let’s rewind three months to a comic published in March of 1963. Tales of Suspense (ToS) #39 introduced the Invincible Iron Man to the world. The creative process for “Iron Man is Born!” seems very similar to the process for “The Creature from Kosmos!” Judging from the credits, Lee was responsible for the basic plot, but he handed off scripting duties to his brother, Larry Lieber. We know Kirby did the early design work for Iron Man and penciled the cover while Heck was responsible for the interior art. Is the situation here analogous to TtA #44? Is it the very same situation with the claim of doing the layouts preceding the writing of the credits box? Much depends on what is meant by “art” and “inking.” It’s likely that later credits would delineate the tasks here as “layouts” and “embellishing” which recognizes a much greater contribution on the part of the inker, but comic book credits were still in their infancy. Some inkers are known for being heavy handed, where their personal style overwhelms the style of the penciller. Could that be the case here? It’s not likely. Let’s look at a couple of examples. Heck inked Amazing Spider-Man #63 over the pencils of John Romita. Here’s a few panels. Romita’s style is undiminished while there are very few indicators of Heck’s influence. We see something similar in ToS #80 where, more on point, we see Heck’s inks over Kirby’s pencils. If we want to see a contemporary rendering of Ant-Man and the Wasp by Kirby, we need look no further than Janet’s second appearance in Fantastic Four #16, published the following month, July 1963. Janet only appears in this single panel. Let’s compare it to this image from TtA #44. The broad scheme of Janet’s outfit is the same in both books. However, in TtA #44 the outfit is more formfitting than the version in FF #16 and it drapes a bit better. Both of these imply Heck’s influence. The other distinct difference is in the outfit’s shoulders; in the TtA version the shoulders are smaller and up swept, making them more evocative of wings. If both versions were pencilled in detail by Kirby, it seems as though there would be more similarity in the details. to this image from TtA #44. The final image in the FF version is far more dynamic, one of Kirby’s calling cards. This second sequence seems much more similar to this sequence from TtA #43, (pencilled by Heck) than it does to the FF version. This isn’t, by itself definitive, there are less dynamic catapult sequences that were penciled by Kirby. Here’s another image from FF # 16. Again, Kirby’s signature dynamism is on full display. It’s tricky to find a similar scene in an Ant-Man story, but here is one of the highlights of TtA #44. The action is depicted competently, but it’s a much more conventional depiction than the fight sequence in FF #16. In the latter piece, most of the action is parallel to the panel, occurring safely behind it. In the first, the reader is either drawn directly into the panel or the action is projecting directly out of the panel, moving directly toward the reader. The action is even more muted in this sequence from TtA #45 by Heck. The scene from TtA #44 looks qualitatively different both from the panels from FF #16 and from Heck’s artwork in TtA #45. It’s possible that TtA #44 is a hybrid, using Heck’s more traditional poses with a bit of Kirby’s flair for action. One helpful consequence of the Ant-Man and the Wasp movie having been released so recently is that many pages of the original artwork for TtA #44 have been for sale online. This makes it easy to find and inspect the artwork to see if anything can be learned from it. Unfortunately, at least as far as can be seen on-line, most of the pencil work is covered by the ink lines or is not visible for other reasons. But there are notable exceptions. In the left-hand panel here, you can see pencil marks probbly meant to depict Janet’s shoulders as she faces the projected image more directly than in the final image. In the right-hand panel, there is an oval in the approximate position of Janet’s head which might indicate an original sketch where Janet’s head was smaller than Heck drew it in the final version. There is an image of page 16 on-line where a lot of the pencil work is visible. Let’s look at two panels from this page. The pencils in this image look rough. You can also see penciled-in placements for the dialogue balloons. That could be Kirby’s handwriting in the balloons, but there’s not enough visible to be certain. What this implies about the plotting process is unknown. The rough nature of the layouts is particularly evident in this image, where it looks like Heck made a number of changes as he inked the final version, specifically, Hank’s arm is at his side rather than on Janet’s shoulder, his foot is moved and Janet’s wings are positioned differently. There’s no reason to necessarily assume that the pencils here aren’t Kirby, but the work is sparse enough that, judging from this alone, they could just as easily be by Heck or any number of other artists. Other Kirby pencils that can be found online are carefully detailed and definitely display the artist’s distinctive style. I’m far from the first person to suggest this but it is clear that Kirby (or whoever did the pencils) did only a minimal layout for TtA #44. Kirby was certainly involved in the design work and the cover art. Kirby is credited for the “art” but there are other indications that he is indeed responsible for the layouts. The technology in the story resembles what we call “Kirby machines” and the design of the creature appears to be more reminiscent of Kirby’s work than much of the other artwork in the story. Although not as dynamic as the art in other Kirby publications, the layouts and the action sequences appear different from Heck’s typical work. But these layouts are sparse enough that to credit Heck only as the inker is an understatement. His style dominates the art in this story and he must have been responsible for many of the fine details of the issue. In ToS #39, Kirby designed the Iron Man armor and Heck developed the look of Tony Stark and the supporting cast. It remains an open question in my mind whether the creation of the Wasp isn’t directly analogous. Based on what I’ve seen so far, Don Heck is an integral part of the creation of the Wasp and I think he should share credit with Kirby, Lee and Hart. I had initially wondered if this name swap was due to some sloppiness in the credits, but it appears that Hart scripted seven stories for Marvel in 1963, two Human Torch stories from Strange Tales (ST) 110 and 111 and the Ant-Man and the Wasp stories in TtA 44 to 48. All of these are credited to H. E. Huntley except the story in ST #111 which is credited to H. Huntley. It’s still possible that the the credit for TtA #44 was an error that was then repeated, but that seems far less likely than if it were a single occurrence. This quote was taken from the Don Heck page at ComicBookDB.com where it is sourced back to Evanier’s “POV Online” column. Speaking of Credit where it’s due, this post was inspired by a discussion with Jared Aiosa of the Heroes Your Mom Threw Out Comic Shop in Elmira, NY. The Don Heck angle was self-evident, but Jared pointed me toward a lot of the other things I investigate here. http://www.comicbookdb.com/ various pages, Accessed 21 November 2018.
https://comics.ha.com/c/search-results.zx?N=790+231+52&Nty=1&Ntt=tales+to+astonish+44&ic10=ArchiveTab-071515, Accessed 18 November 2018.
https://www.comicartfans.com/GalleryPiece.asp?Piece=881466, accessed 24 November 2018.
https://www.syfy.com/syfywire/celebrate-stan-lee-95th-birthday-with-six-ways-he-changed-comics, accessed 24 November 2018. Happy Thanksgiving! Great Star Flag. It’s been awhile since I changed the flag outside and I decided to swap for today, in honor of the holiday. Specifically, we’re now flying a 35-Star American Flag with the stars in what is known as a great star configuration. The 35-Star Flag became the official flag of the United States on 4 July 1863 when a star was added for West Virginia. It remained the official flag until 1865 when the 36th Star was added to represent Nevada. The relevance to Thanksgiving Day? Although the holiday was celebrated a various times prior to 1863, the modern celebration dates back to 1863 when Abraham Lincoln called for a National day of Thanksgiving on the last Thursday of November. This was the national flag on that day. There doesn’t seem to be a lot of historical evidence for a 35-Star flag with a great star configuration, most show the stars in a rectangular array. Congress doesn’t typically specify the configuration of the stars, but there were 20, 26, 33, 34 and 36-Star Great Star variants. Great stars were popular and commonly flown on private ships in the early part of the 19th Century. Other sources indicate that this flag was used for later periods of national mourning, including for President Kennedy in 1963.